The following is excerpted from my essay that just appeared 10/7/12) in Poetica Magazine. This day in August 2012, I am one of a handful of David Blumenfeld’s descendants exploring the streets of Tukums. Through the “Diary,” we cousins have spent the last four years getting to know each other and our shared history, and Fred and Deborah have been critical interpreters in my belated proper introduction to Jewish culture. Their side of the family remained in the Midwest and clove to tradition. Mine left their families behind to pursue a new life amid strangers on the West Coast. I now know this was — for my mother, at least — a logical follow-up to the peregrinations of her father, grandfather, and great-grandfather — peddlers all, of one sort or another. But what her grandparents left behind, and why, why her own mother fell (or jumped) from the Jewish tradition, who we really were — some of these answers have assembled themselves from the Diary. 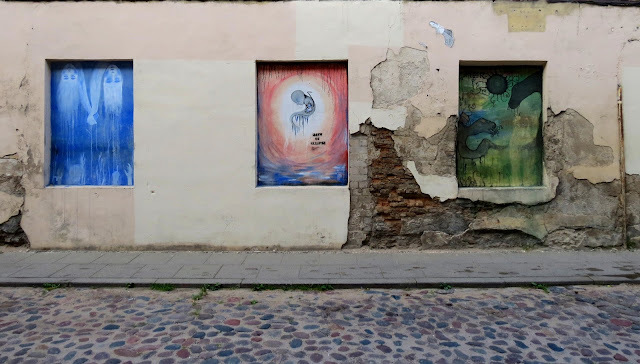 Others we knew we’d have to come to Tukums to unravel, this ancient town on one side of the ocean and the vast new world on the other –cross from present to past. Having pored over the Diary, trawled the pages of censuses and lists of the murdered, questioned our mothers and uncles, flown the miles and hours, and at last having paced the smooth swirls of gray cobble in Brivibas Platz – Liberty Square – and seen the walls our ancestors saw every day – having set foot in the garish gymnasium that was their synagogue – I am beginning to see the ghosts of the Blumenfelds. We are finally beginning to materialize, them and us. And we must not forget the heretofore mysterious in-laws the Klatsovs. 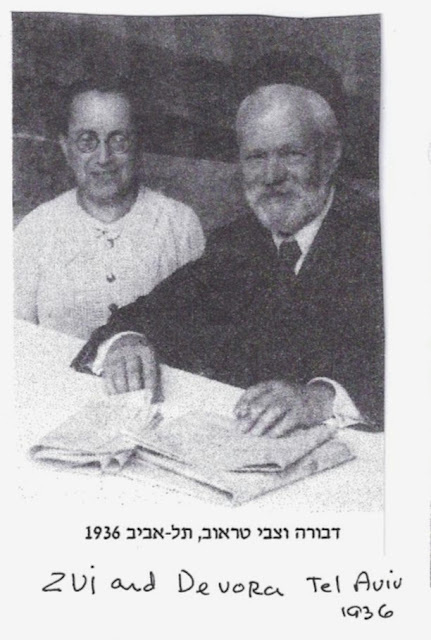 Up until 2010 I’d thought (as did my own grandmother) that my David Blumenfeld’s mother’s maiden name was Gottshalk. But there were no Gottshalks in Tukums. However, the death certificate I finally found showed her father’s name as Klashoff, and although Tukums had no Klashoffs either, it did have Klatsovs, and furthermore they all had the correct first names and birthdates. Thank you, Internet. And today we stand before a large, modern (which is to say nondescript) bank on the spot where the squat, tile-roofed, family store sat for decades. Where did the Klatsovs go? My cousin Bob notes later that we are “looking for roots, in a place that saw two totalitarian empires engage in a ruthless extirpation of roots.” And it’s true, much of what we come across in Latvia consists of absence. Starting with the Jews, of course, whole towns-worth of human beings obliterated. And now even the buildings gone, sites replaced, repurposed, disguised as libraries and basketball courts, or long demolished and replaced by a bank. The Jewish cemetery on the edge of town is hidden and barely accessible through stands of wild bushes and dry grass tall enough to hide the effaced and lichen-etched stones; the bloodcurdling crescendo of a dog-pack’s snarls echoes through the pines from what I am glad turns out to be the local off-leash park. The Gone. Gardens and squares bear statues and busts of the dead and the heroic amid the tidy flowerbeds – in homage to humanity, to complement nature (both marble and flower are well-artificed, asserting our stubborn will to instill beauty as well as dignity amid the desolation). Outside of town, the countryside is studded with abandoned factories and never-completed apartments from the Soviet era. But in the surrounding farmlets, the narrow alleys of Tukums, it is the humblest of abodes that most often remain in daily use – the People endure when Empire has shattered. Except, that is, for the Jews. So where are our Klatsovs? At the Jewish Museum in nearby Riga I was stunned to discover the names of both our great-great-grandfathers in the index of a fat book on historical properties in Tukums. There were grainy photos of these buildings through the ages, along with descriptions of the history of ownership. We noted the addresses and drew circles on our maps. We hoped to touch history. But houses here, even shops in full swing, show generations of modest rejuvenation – layers of plaster over worn planks, paint over chipped plaster, new paint over old, color over color, like aged and grimy bandages barely binding shattered and tilting skeletons. As with the architecture, so with our lives. Here then is the house where our great-great-great-grandfather Jossel Blumenfeld lived – well, the spot where his house once stood, anyway – indeed an old house but not old enough, despite its tilt, its dust and tattered blinds – built only in 1924 long after his death. Someone lives here now, someone unrelated. To us, and perhaps to the past at all. Someone who in all probability knows nothing of this house’s ghost — or of the whole town’s ghosts, since decades of shame and horror have omitted the Jews from the local education, and there are so few left here that even the alive and well exist almost subliminally. This small brown house sits in the space where Ben Zion Blumenfeld grew up with his father, was drafted into the Russian army, around the corner from the square where he was drilled, and the synagogue — in which now kids play basketball – where he met his wife-to-be. Leah was daughter of prominent shop- and property-owner Yankel Klatsov, who raised a family of girls and a favored son, David; David would inherit the family fortune, stay in his home town, raise his own family of girls and a son, and feel no need to take the desperate and perhaps foolish chance that his luckless brother-in-law Ben Zion took (after an almost comical series of business failures) by moving his family lock, stock, samovar, and featherbed to a new country where neither German, Russian, Latvian, Hebrew, nor even Yiddish was a common tongue, where chances were that success would be equally hard to find, but where at least his sons would be safe from the Czar’s army. In Tukums, David Klatsov saw no reason to move. He thrived. He did not fear the future. Cousin Fred, learning that the shop that sat calmly at the center of Tukums picture postcards for a hundred years had passed on to David Klatzov before The War, on a hunch looks him up on the Yad Vashem website. Typing the name is like the midnight phone call, the pounding on the door: Slaughtered by Nazis, aged 86, July 1941, with son Mordecai. As well as hundreds of other Tukums Jews. This then, we clarify to the museum director during our visit, is why the store closed one day and never reopened, why it sat vacant for years and then fell to the wrecking ball. The owner disappeared one day and never returned. Not because he had gone to America to find his fortune: because he hadn’t thought he needed to. En route to Tukums we drove through fields speckled with tall storks as in a fairytale, white with black wings, legs and beak blood-red, perched on thickety nests atop telephone poles and barns. But like we’ve found by walking our family story down these time-soaked streets, the stories are true — these aloof creatures truly have flown from Africa, to nest… They really follow the ploughs across the wheat fields hunting voles, frogs, crickets turned up by the blades. A symbol of luck, it’s said, but to whom? They didn’t bring luck to the Tukums Jews, the Riga Jews, or the Jews of Kaunas, Lithuania, where we will head next. They are rather a parable — of hope, of the freedom to raise one’s children and risk journeying as far as necessary to do so.… Perhaps the stork could be the symbol on the Blumenfeld crest. If there were one. This is where, this is how I begin to solidify my heritage, not so much “find myself” as place myself — yes, nailing the family story for accuracy’s sake, for my own children, but confirming that it’s more than just apocrypha. Tukums’ swirling cobbles serve as the hard evidence, as small gravestones our names are now etched into. We follow the plough of history, free for now, and hunting our sustenance from what has been left to us. Soon after returning home, armed with the Klatsov information, I stumbled upon a family tree (surname Behr) on the Internet which gave some further names and connected a few more dots. Soon my cousin Fred and I had uncovered a trail of direct Klatsov descendents from Tukums to Palestine in 1925, and thence to America, most of them neatly avoiding the Holocaust. One exception was Julius Drabkin (1918-2003), one of David Klatsov's grandsons, whose harrowing story has been recorded -- and you can read the transcript at this link -- for the The Bay Area Holocaust Oral History Project. Amazingly, there was a large contingent in Southern California, practically in Fred's back yard, whom he had never known about. Since then, they all have had a reunion - many of the California cousins hadn't met each other in decades, and of course none knew there was another line of descendants in the States. 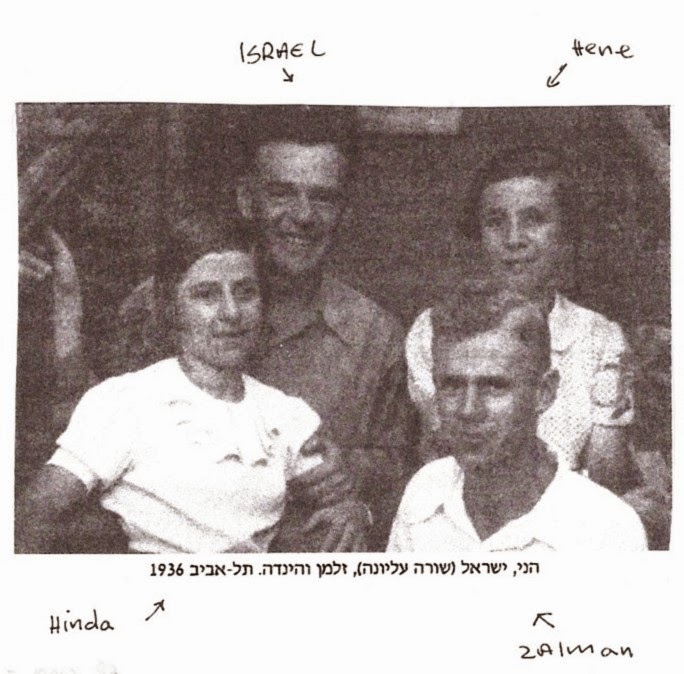 Fred also traveled to Israel and met the other contingent, who were equally amazed and delighted to find more surviving descendants. They were able to provide a few precious photographs, some of which follow. 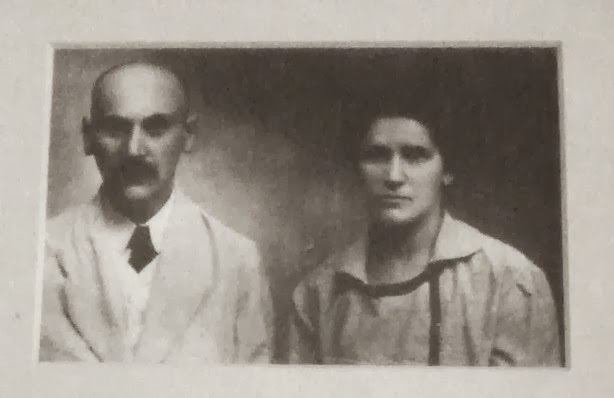 Devora's sister Sarah Klatsov and her husband Mischa Drabkin perished in Riga in 1941. Their son barely made it through the war, and eventually moved to the US with his family. The children of Devora Klatsov Traub (with stepson Israel Traub): Hene 1898-1990, Hinda 1908 - 1993, Zalman 1913-1984. By the way, I have a few contemporary shots of Tukums on my other blog. Wrapping up my Baltic posts over on The Eff-Stop with some quintessentially Eff-Stoppish wall shots such as this one. Pay me a visit there!